Enjoy the feeling of new skates long after the shine is gone. Hey, I just found this post of yours and was wondering how the Sirens are holding up. I had talked with Trish at SCS and she was luke-warm about them, but my heels are squirley all over in my old 265s (although apparently the new ones are made on a split last now). I'm sure you've figured out the Reactor plates by now, but they do take some adjusting to get them how you want them. If you're still feeling like they're all over the place, try loosening up the trucks a bit. Hey Tilda! 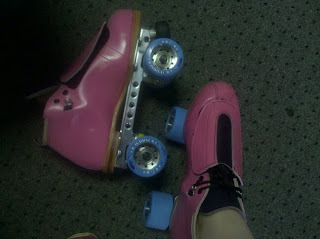 I LOVE my skates. Love, love love! The fit is amazing. The plates are still taking some getting used to. I have to cut... differently than I used to. It's hard to describe, but I feel like I have to turn my foot a bit more. I'm getting better with them though, and I will try loosening the trucks a bit. But the boot overall? So very happy with it. It's perfection!